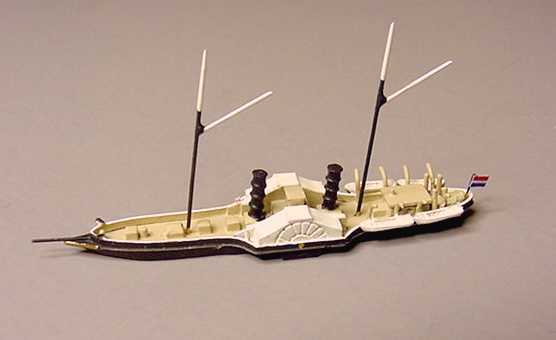 The Dutch Armed Yacht "De Valk"
This model is of the De Valk that was used as a royal yacht in the 1860’s. JW (Johann Wolkersdorfer) presents a very detailed paddle wheeler that is also ready to sail if the engine stalls (the sails are furled). These shallow-draft Dutch ships were able to navigate the waters of Holland, when others failed, but they did occasionally venture out to the deep sea. 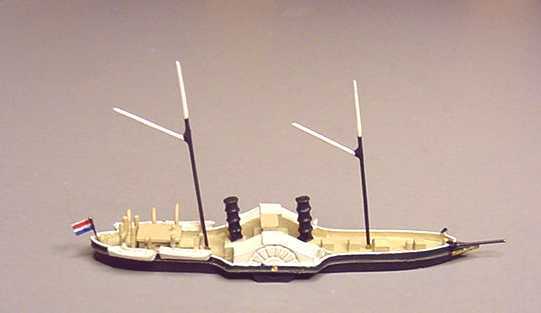 This model is a fine piece of JW workmanship in a series of ships of historical significance. Synopsis: The De Valk’s keel was laid at the Royal Yard in Amsterdam in 1863. She had a crew of 120 men and was armed with six 12 cm (4.7 inch) cannons. Prince Hendrik and his royal spouse were in the De Valk during their Mediterranean Cruise in 1869 as well as during the grand opening celebration of the Suez-Canal.